Pay As You Go. Pay as you use. Bascially phone credit adeapted for equipment. You pay and the equipment works for as as your credit lasts. It allows suppliers and/or their banking partners to offer more credit, which makes the equipment easier to afford. While the developed markers do not need more credit, growing economies where personal and small business cash budgets are tight, do. 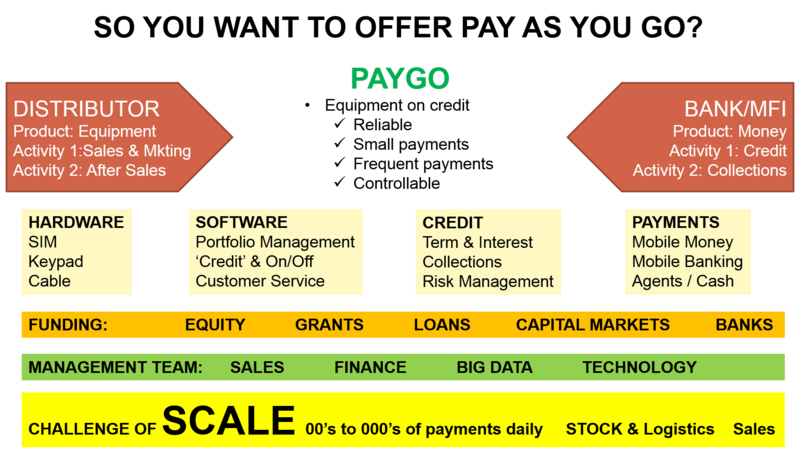 PAYGO means they can get access to equipment such as solar, computers, small transport without saving up first, offereing collateral that they don’t have, or showing an established credit history.